You can pretty much set your watch to it at this point. A certain contingent of white people is once against incensed at LeBron James. Disgusted. Siiiiiiuuuuck with rage. 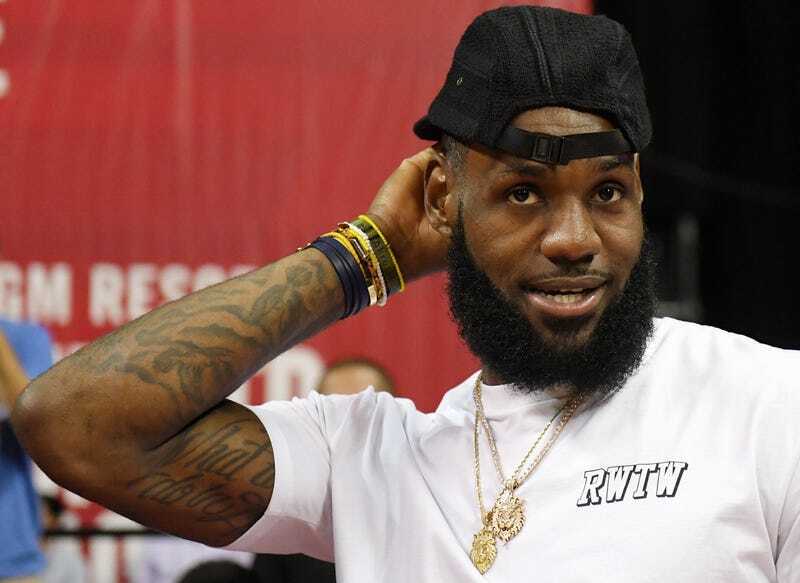 LeBron James had the nerve, the gall, the appalling lack of shame to show love to black women on his Instagram account Wednesday. In two separate posts with the same caption, James shared galleries of magazine cover photos featuring black women. These included Beyoncé’s recent Vogue cover, as well as Rihanna on British Vogue, Lupita Nyong’o on Porter, Zendaya on Marie Claire, Tiffany Haddish on Glamour, and the ladies of Pose on Out magazine. As The Glow Up’s Maiysha Kai has noted, this has been a stellar fall season for black women landing the covers of major magazines. September issues—the biggest and, for many glossies, the most lucrative issues of the year—are huge deals, and we’re seeing an unprecedented array of black celebrities and models gracing their covers. James is far from the only one to notice or point out the importance of this kind of representation (and affirmation of black women’s beauty and cultural power), and his inclusion of trans women is particularly notable. But the Saltine Americans among us can’t let LeBron live, predictably flooding his comments with bland, “All Lives Matter”-flavored tears. JohnnyBoy.631 with the saltine hypothetical: “Let’s do a role reversal now people. Now let’s say Tom Brady or Tom Cruise or George Clooney for that matter came on IG and said “NOTHING IN THIS WORLD IS MORE POWERFUL THAN WHITE WOMEN.” I know ya mofo’s would be having a fit! And chatnigga with: “lebron and beyonce best power couple.” Okay, that one doesn’t actually fit in with the rest of these comments, I just wholeheartedly agree. Also, sorry Jay-Z. You might recall the same fate befell Sean “Diddy” Combs when he showed black women some love on his Twitter timeline. It’s almost like it’s a pattern or something. Of course, this conversation has been gone over time and time again, but oh well, it’s summer and we have time. White people, in fact, do a version of what James did. But typically, when these white people—and more importantly, white institutions, like the very fashion mags James was sharing—big up white women, historically, they just called them “women” and left out everybody else. The prototypical “American” women as so white you didn’t even have to place “white” as a descriptor; it was assumed, and everyone else got the hyphen. But don’t believe me, believe the years and years and years and years of magazine covers, articles, books, movies, television shows to examine the evidence. In the meantime, I’ll be over here, buying these covers like Maiysha told me to, and stanning for my president.